The male part of the High-End quick release connectors. The new generation of quick release connectors was specially designed for Highflow systems. It has the great quality of manufacturing that everyone is used to receive from Aquatuning. Both the male and female connector are equipped with a special profile to ensure that the pieces cannot cant, therefore ensuring that the connector is always sealed properly. When connected the silicone ring of the male connector additionally expands to make contact with the female connector's inner wall to ensure the best seal possible. To avoid any loosening when in use the two pieces are additionally connected by twisting them, making it impossible to separate them until they are twisted back. 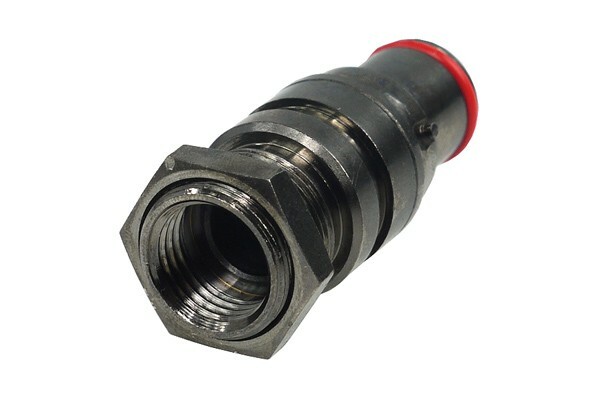 The connector is equipped with a G1/4" thread which gives virtually unlimited versatility! To ensure a tight seal between coupling and plug the units are designed for a very tight fit. When repeatedly plugging the connectors in and out, this may lead to roughening of the O-ring or even tearing of the gasket. Hence the gaskets should always be kept moist when plugging the connection in or out! A torn gasket is not covered by the warranty but is rather caused by incorrect use of the unit. Spare O-rings can be ordered with the item number 95002. Note: For operation of the coupling the female counterpart is required. These connectors are also compatible with the Koolance VL3 connectors.